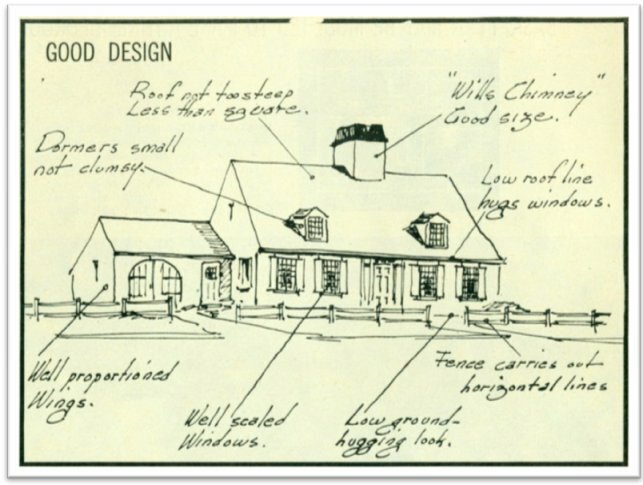 Last week we gave you a quick origin story of the Cape Cod style house. Over the years, the Cape has evolved into larger, family-oriented homes. Many lost their original simple charm, paving the way for more modern colonials. In fact, many of the original Cape houses are gone or have been renovated or added to to the point that they are no longer recognizable. But in the mid-1900s there was a resurgence of the style, thanks to Royal Barry Wills. Wills was born in Melrose, MA and graduated from MIT in 1918 as an Architectural Engineer. To advance his career, Wills started publishing plans/sketches in a local publication and answering architectural questions from readers. He became a registered architect in 1925 and began honing the famed Cape Cod in a modern way. Will's artistry brought refinement to every level of planning, engineering, and detail of the Cape Cod model. Wills was very particular about each point of the home and defined the exact characteristics that made this style unique and quintessential. Of course, Wills knew and worked with modern materials and designed his share of contemporary houses. But he chose to focus on the Cape and specialize in the design of this ubiquitous home. He understood the soul and essence of the structure… “If the’re kept simple the way they were intended to be, they’re almost as modern as Modern” (Wills). One important note: Wills didn’t “copy” the original Cape houses. Instead, he imbibed the sense of “charm” into the original style, which clients gravitated towards. “Clients responded favorably to such features as garden gates and they welcomed the craftsmanship of oversized hand-wrought hinges - elements that modernists stripped from the American home.” (Morgan, “The Cape Cod Cottage”) In 1946, Wills wrote, “I suppose the reason Cape Cod Houses are so popular is that they are the simplest expression of shelter.” The Bees couldn’t agree more. One of the ways in which Wills “modernized” the Cape is that he allowed for a larger home to accommodate families by extending the house to the rear or sides. By growing it into a U-, L-, or H-shape, he was able to create a larger structure that worked for modern families. However, one of the details that he was always a stickler for was ensuring that the front of the home was always a one-and-a-half story Cape. Notice the front facade of the home is the typical Cape; however, Wills expanded his “functional” home, with a modern-day garage, from the sides, ensuring that the original “form”of the Cape still remained. Coincidentally, if you’re an architecture buff (or even if you aren’t! ), other great architects were thriving at the same time as Wills: Frank Lloyd Wright with his modern Prairie style homes and Walter Gropius, studying at the Bauhaus. But where these other architects were creating their own “style” and “form”, Wills felt it more important to focus on bringing back a simple, yet charming original style and create a Renaissance of his own. And the Bees love him for that specific reason. Now that you have a history of the Cape style, it’s time to start focusing on the Bees’ favorite part: the INTERIOR DESIGN of the Cape. Next week, we’ll begin delving into the interior detail items of the homes. We’re so excited!